Last week Microsoft introduced their HoloLens2, the successor of the mixed reality HoloLens which we knew for a couple of years. Up till now, HoloLens is mainly used within larger corporations for lowering maintenance costs (like Boeing and ThyssenKrupp). 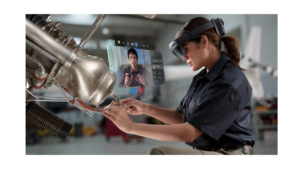 But with HoloLens2, with increased viewing angles and all new Microsoft Dynamics 365 mixed reality applications for HoloLens2 there are now possibilities for digital innovation within SMBs. Onboarding time for new employees within industrial organizations can be shortened with the use of mixed reality. Instead of training new employees in a classroom with use of PowerPoint slides and exploded view samples, new hires now can learn easier and quicker within a live production environment. With HoloLens2 maintenance engineers can perform quicker and better maintenance on machines and installations. The mixed reality views help them locate parts and components much faster and with higher precision, which decreases fault margins dramatically. Engineers can now use mixed reality when designing and prototyping their products. HoloLens2 with mixed reality boosts their innovative and creative minds whilst helping them with accurate measurements. 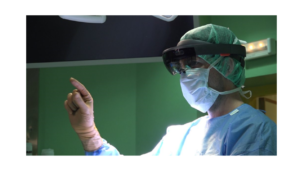 Within healthcare (medicine and surgery) there are some examples where using Microsoft HoloLens helps with faster surgery times, less collateral damage for the patient and with that shortening patient’s recovery time. Besides innovation this brings a tremendous cost reduction within the healthcare industry. Mixed reality helps businesses, governments, institutions and NGO’s boost their innovation. Mixed reality is the combination of virtual and real life and with that, helps people better understand what they are facing and finding creative solutions. Just try to imagine what mixed reality can do for your organization and innovation …. Talk to one of the Quexcel Digital Transformation consultants to discover more.